Baltimore's Little Italy is an old quaint Italian neighborhood in Baltimore City that has survived and thrived for several generations. Its original immigrants emigrated from Italy in the mid-1800s into the early 1900s and by 1920 the neighborhood was 100% Italian. It boasts century-old row homes, family-run restaurants, bocce courts, Catholic Italian parish, cultural Learning Center, Sons of Italy lodge, and much more. 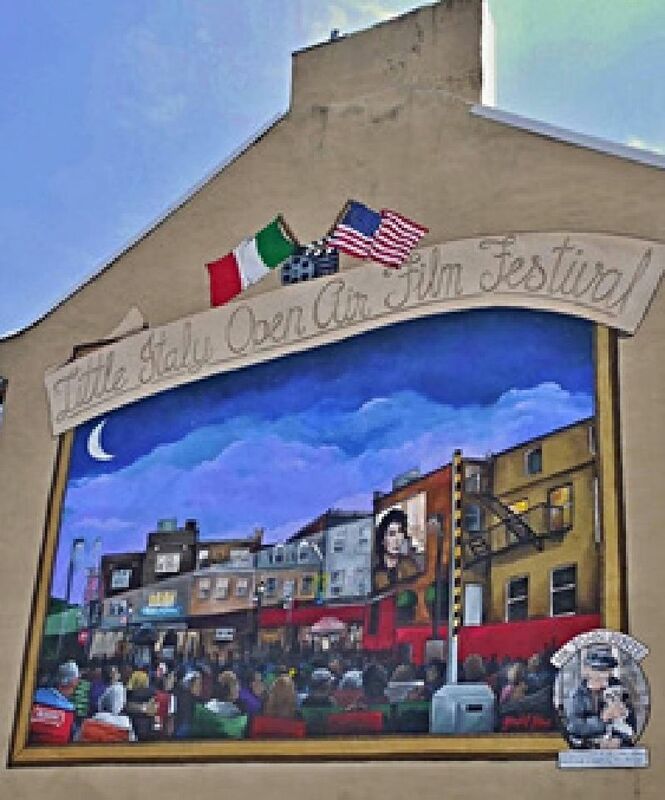 Lovingly nicknamed 'The Neighborhood,' Little Italy is a tight-knit Italian community that includes residents of other ethnic backgrounds as well. It continues to welcome back its people who grew up here and who still feel a connection and deep devotion to the community. Stroll through its friendly streets to say CIAO! on President Street holds the Italian Carrara marbled Columbus statue and historical plaques dedicated in 1984 by President Ronald Reagan. The piazza is encircled with Italian flags. Each October during a wreath laying ceremony, a few dozen local civic (mostly Italian) organizations pay homage to Columbus by laying floral wreaths at the base of the state. A Columbus Day parade follows. at Fawn and Albemarle Streets is the former home of two Baltimore mayors of the same political family - the D'Alesandros. Daughter Nancy (nee D'Alesandro) Pelosi is a U.S. Congresswoman and grew up here..
is an 1866 building on Central Avenue named after the canal that once ran down the middle of the street. Long ago, the structure was the Solomon’s Straus’ Malt House, named after the brewer who built it. The warehouse supplied malt to Baltimore’s brewing industry as well as exported it to the west and south. are open to the public. You can also spectate Little Italy's bocce league play on Tuesday, Wednesday and Thursday nights between May and October. Bocce tournaments are held during both summer Italian festivals and Columbus Day Celebration in October. marquee at Albemarle Street and Eastern Avenue posts a brief history of Little Italy and is one of 20 markers in Baltimore City depicting historical sites along a 3.2 walking tour called the Star Spangled Trail. is a historic building once a Confederate hospital for wounded solders; later home of the Holland Manufacturing Company (aka Tack Factory). It now houses various businesses, an Italian bakery and restaurants. The historic PRESIDENT STREET STATION dates to 1849 and is one of the oldest big city railroad stations in the nation. It played an essential role in the story of some Italian immigrants who arrived by ship in New York City and continued to Baltimore by train. It houses the CIVIL WAR MUSEUM (FREE) 601 Pres. 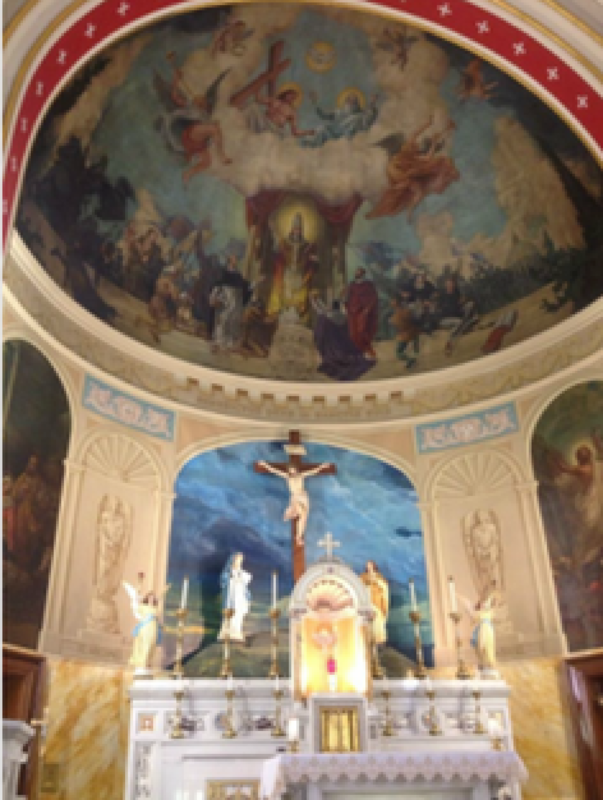 St 443-220-0290.
was built in 1881 for the Italians and contains historical paintings and beautiful ceiling murals. On its exterior walls is a historical marker, War Memorial Plaques, and other memorial signage. Under the entry steps are engraved bricks honoring family names. Saint Leo the Great Church is listed on the National Register of Historic Places. It hosts four major events per year: two Italian Festivals and 2 Ravioli Dinners. 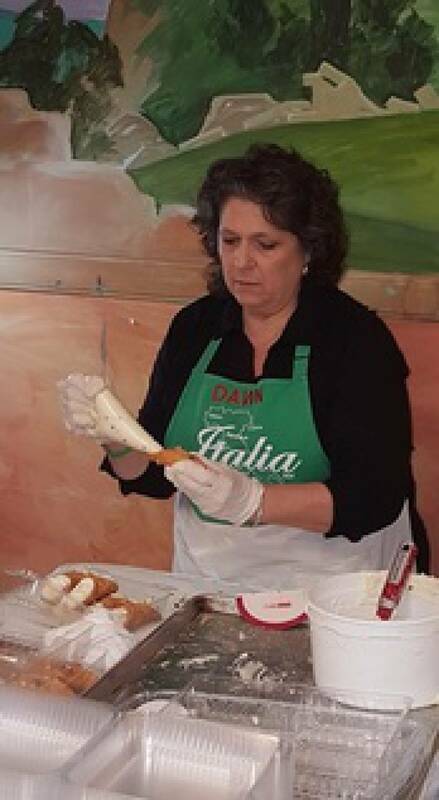 housed in St. Leo School at 908 Stiles St offers Italian language, cultural and cooking classes for adults and kids during two semesters in fall and spring. SONS OF ITALY LITTLE ITALY LODGE #2286 is an arm of the national Order Sons of Italy in America and was built in 1990; 905 E. Pratt St, 410.685.3116. It hosts Friday Night Dinners each week and many dances and trips. Consider becoming a Lodge member! 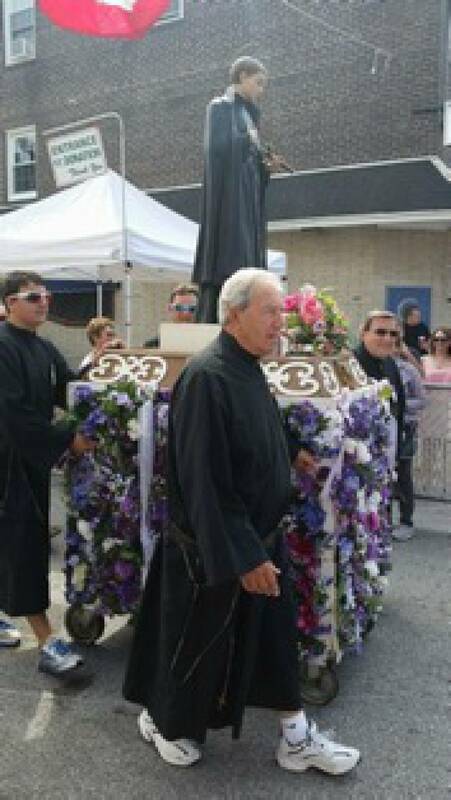 of a St. Leo procession, although faded, is sighted on the wall in the parking lot at Eastern/President Streets.